A luxurious 3 Bedroom/2 Bath Bayside Beauty with a Rooftop Pool. Exquisite Captiva Bay 101 - Time for YOUR Luxury Vacation. Located on 85th Street with a Rooftop Pool and Bayfront Dock. 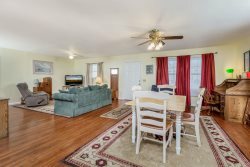 Gorgeous 3 Bedroom Bayside Condo in Ocean City, Maryland. Room for everyone in this spacious, well appointed Condo. Captiva Bay 101 sleeps 8 people in style and comfort. Large Dining Area for wonderful Family Meals. Dine indoors in the comfort of AC, or Al Fresco on your huge wraparound Balcony. High-end Appliances and incredibly well-stocked Kitchen. The Chef in the family will love this awesome Kitchen. Beachy white bead board and gleaming Corian Counters. Captiva Bay is a gorgeous Bayfront building in a great location. Fish, crab, or launch kayaks from Captiva Bay`s Dock. Enjoy waterside strolls and catch one of our famous OC Sunsets. You`ll be surrounded by nature and wildlife in this Bayfront location. Fabulous Rooftop Pool with forever views of the Bay and the Ocean. View overlooking the Bay from the Rooftop Pool. Check out that OC Skyline and Ocean Views from the Pool Deck. Master Bedroom with King Bed and access to huge Balcony. Spa-like Master Bath with Jacuzzi Tub and Separate Shower. Soothing Coastal Colors throughout this beautiful home. Sink into a soothing, relaxing Jacuzzi. Bedroom 2 has a Twin over Full Bunkbed with Twin Trundle. A 2nd Full Bathroom for your convenience. Bright, sunny yellows and blues adorn this cheerful, beachy home. Bedroom 3 has a Queen Bed and access to the Balcony. Bedroom 3 also has a TV. Handy Laundry Room for your convenience. Huge Wraparound Balcony with Bay Views. Truly the largest Balcony we have ever seen. Dine Al Fresco and enjoy the Sea Breezes. Captiva Bay 101 - Captivate your family with the perfect Ocean City Vacation! Welcome to phenomenal Captiva Bay 101 - A truly luxurious vacation experience in famous OCMD. With Bay Views, Ocean Views, and a Rooftop Pool, everyone in the family will love this gorgeous Condo! As you enter through the spacious Foyer with Custom Tile, you will love love how open and airy this home is. Colors of sunshine and sea will welcome you, and you'll know you chose the right place to spend your well deserved vacation days! Upon entering the Living Area, the spaciousness of this home will delight you with high ceilings and more than enough room for the whole gang. The Gourmet in the family will love the well-stocked Kitchen with high-end appliances and everything you need to make mealtime super easy. Gleaming Corian Countertops and Coastal White Bead Board Cabinets add a light, beachy feel to this Kitchen. Enjoy your meals at the huge Dining Room table or dine Al Fresco on the enormous Wraparound Balcony that has great Bay Views. And we have to tell you about this Balcony! This never-ending Furnished Balcony wraps around the Condo from the Bayside to the Oceanside, with views of both! Just imagine enjoying your morning coffee while you watch Seagulls fish in the Bay, and take in that sweet, salty ocean air. Captiva Bay is located directly on the Bay with a wonderful Private Dock you may use to fish and catch crabs. And there is no better place to take in one of our famous sunsets. Stroll along the water's edge with a glass of wine after dinner and take it all in. The Kitchen overlooks the large Dining Area and cheerful Living Area. After a wonderful day on the Beach, sink into the tasteful, comfy furniture and enjoy the Flat Screen Cable TV and Free WiFi. There is even a cozy fireplace for those chilly off-season OC nights - one of our favorite times at the Beach! With two walls of mostly windows, you can take in those beach town views even while relaxing at home. The Owners have done a wonderful job surrounding you with Coastal Charm and cheerful colors. Just off of the Living Area is the Master Bedroom with a King Bed, which also has access to the Balcony! Mom and Dad will love sneaking out here at night and listening to the water lap against the dock. The Spa-like Master Bathroom will add even more luxury to your vacation with a relaxing Jacuzzi Tub and Custom Tilework, and there is also a separate shower! A large Vanity and lots of storage round out this awesome bathroom. On the way to the kids' rooms, you'll pass the convenient Laundry Room. While no one likes doing laundry, this certainly does make a week at the Beach much easier. Bedroom 2 has a Twin over Full Bunkbed with a Twin Trundle, and lots of room for the kids to spread out. There is also another TV, which comes in handy on a rainy day or when the kids insist on cartoon time. Super sunny Bedroom 3 has a Queen Bed and also enjoys access to the awesome Balcony. Another Full Bathroom is shared between the two bedrooms and has a Tub/Shower Combo and huge Vanity. There is also a handy Half Bath adjacent to the Living Area. Captiva Bay is an exquisite complex with many luxurious amenities, including an absolutely fantastic Roof Top Pool! You can see forever from the Pool Deck - the Ocean and Bay Views will take your breath away! And of course there is the Private Dock where you can also launch your kayaks, or simply sit in an Adirondack and sip sweet tea. All of this located in a quiet location on 85th Street. You can walk or ride a bike to the Beach, many fine restaurants, mini-golf, and more. And the famous OC Boardwalk is just a short drive away. Captiva Bay 101 - Don't YOU deserve the very best? Seaside Vacations does not allow group rentals to guests under age 25, Senior Week Groups, or Bachelor/Bachelorette type party groups. Therefore, online bookings for group rentals will not be honored. Staff was exceptionally responsive to our needs, especially as I am disabled. Elaine saw to it that my safety and comfort was a priority. Comfortable and very enjoyable experience! Will definitely return!